Members may click on ECG for Everyone to watch a video on how to easily identify all ACLS arrhythmias and how to use the ACLS algorithms to treat them. Technically Supraventricular Tachycardia (SVT) is a broad term that covers both atrial tachydysrhythmias (such as atrial flutter and atrial fibrillation) and atrioventricular tachydysrhythmias. However, in common practice most healthcare providers use the term Supraventricular Tachycardia or SVT to refer specifically to arrhythmias that are atrioventricular tachydysrhythmias. 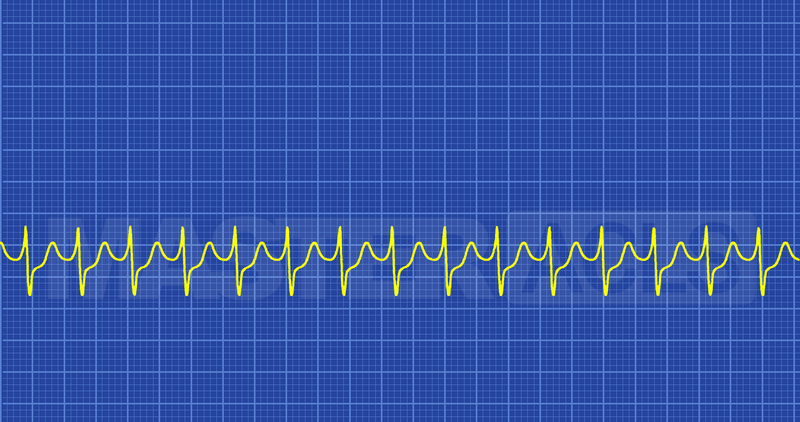 These arrhythmias arise from an abnormal electrical impulse produce by or dependent on the AV node. AV re-entrant tachycardia (AVRT); involves a reentrant circuit formed by aberrant myocardial accessory pathways between the atria and ventricles. Conduction may be orthodromic or antedromic down the normal His-Purkinje pathway, the latter tends to produce a wide QRS complex. In all types of SVT symptoms result from the fact that the heart fills during diastole with diastole being approximately 2/3 of the cardiac pumping cycle and the faster the ventricular rate the less time the ventricles have to fill. If the ventricles don’t fill then the cardiac output drops causing less blood to be pumped to the extremities and less blood to be returned to the heard to feed oxygenated blood to the myocardium and be pumped again out to the body. This drop in cardiac output results in the following symptoms getting worse as the cardiac output continues to drop unless the ventricular rate is slowed. Consider and treat all underlying causes while providing symptomatic are and support for all stable patients. Vagal maneuvers and Adenosine may be used to slow stable WVT to make it a better perfusing rhythm or to convert stable SVT patients to a sinus rhythm. Unstable SVT should always be treated with synchronized cardioversion immediately. Recommended dose is 50-100 Joules. Drugs should not be used to treat unstable tachycardia.